Finding new treatments for people who suffer temporary paralysis and other muscle diseases is the hope of Wright State University researchers who have been awarded $2.7 million in federal grant money to study electrical signaling in the body. Electrical signals produced by the body cause muscles to contract or flex and are essential for movement. The larger electrical currents — generated by proteins such as sodium and potassium channels — have been extensively studied over the past 50 years, but the smaller currents are much less understood. Rich said treating patients by blocking the main electrical channels is like using a sledgehammer and can risk paralyzing the muscle. Being able to regulate the smaller currents holds out the promise of more targeted and effective treatments. Voss likens it to looking at the foundation of a skyscraper instead of focusing on the upper stories. Disorders of muscle electric signaling include periodic paralyses in which patients become paralyzed for minutes to hours or where the muscles become too stiff for movement. “These are rare diseases, but can be devastating for those affected,” said Rich. Rich said the research may also shed new light on how electrical currents work in the normal muscle. “We may figure out some things about how normal muscles work and how they affect a wider range of diseases,” he said. 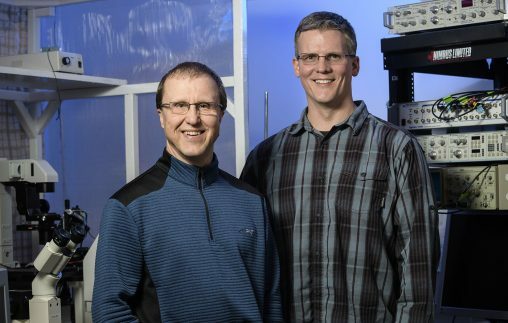 The two researchers have already had success measuring small currents in isolated muscle, as reported in the Annals of Neurology, and are working to extend that work to the whole animal. That will be necessary before they move on to clinical studies with human patients. Rich grew up in Kansas, where his father taught chemistry at Bethel College, and later in Tokyo, where his father taught at the prestigious International Christian University. Rich earned his bachelor’s degree in chemistry and biology from Bethel College in 1983 and his medical/Ph.D. degree from Washington University in St. Louis in 1989. He completed his neurology residency at Johns Hopkins University in 1993, a neuromuscular fellowship at the University of Pennsylvania in 1998 and then worked as an assistant professor at Emory University. Rich joined the faculty at Wright State in 2005 and is currently co-director of neurology/psychiatry/muscular-skeletal course for second-year medical students at the Boonshoft School of Medicine.